Francine's Friends: Are YOU Ready for Summer? Even though the weather hasn't always felt like it lately, summer is just around the corner and Francine's Friends has a busy June, July and August! Along with our coach schedule for mammograms (click here to view), there will be many other wonderful opportunities to spend time with "Friends" (click here for current third-party event dates and descriptions, along with our annual official Francine's Friends event dates). You can also like and check out our Facebook page for the late-breaking information, events, and coach locations. 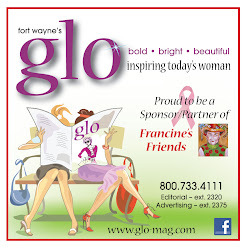 If you know of an organization who would like to sponsor a fundraiser to benefit Francine's Friends, please contact Glynda Harris (harrishome3@frontier.com or 385-1601) for more information.